This is a delicious and colorful side dish for a pot-luck. Prepare edamame according to package directions, omitting salt. Drain. Heat olive oil in a large nonstick skillet over medium heat; add celery, onion, garlic and jalapeño to pan; cook 2 minutes, stirring frequently. 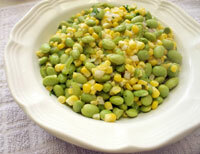 Stir in edamame, corn and wine; cook 4 minutes, stirring frequently. Remove from heat. Stir in salt (if desired) and pepper; sprinkle with parsley. Serve immediately. Posted in Recipes. This entry was tagged diet, edamame, healthy, nutrition, recipe, recipes, soy. Bookmark the permalink.